The Spanish capital is a great choice for a city break weekend or short stay holiday, it has impressive plazas such as the Plaza Colon, Plaza de Santa Ana and Plaza Mayor where you can enjoy a drink or tapas with the locals, you can take in incredible art galleries and museums for example you could stroll up the impressive Paseo de la Castellana and visit the famous Prado Museum, also the Thyssen Museum and the Reina Sofia Arts Centre are not to be missed. All sports fans will know Madrid is home to the richest and one of the most famous Football Clubs in the world, so a visit to the Bernabeu stadium could be a possibility on your busy short break schedule! 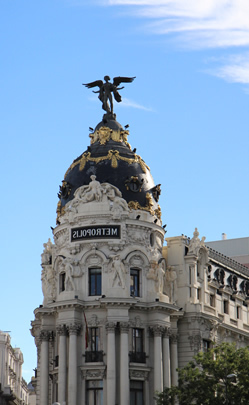 Madrid city breaks owe much of their popularity to the atmosphere of the city and its amazing residents (Madrileños) rather than its impressive monuments and sights. Visitors will enjoy this most characterful of Spanish cities great night life with excellent specialist bars that attract you with live jazz acts or flamenco alongside modern bars and nightclubs. The amazing late hours kept by the residents with bars and clubs still packed at 4am all add up to a 24 hour a day holiday experience. Long weekend and short stay visitors to Madrid will not fail to be impressed by the astonishing profusion of characterful cafes, wine bars, tapas bars, pavement cafes and restaurants in the central area. Weekend breaks are perfect for mixing with the Spanish themselves. Take time out to stroll around the contrasting neighbourhoods that stand side by side and are easily reached on foot for example La latina, las salesas and Malasana. There is a wide range of accommodation from cheap hotels through to chic 4 and 5 star deluxe for that romantic, luxury weekend or special occasion. Madrid has plenty to offer as well as art, fine food and nightlife, Madrid mini breaks offer tremendous shopping, the city has plenty of major department stores such as El Corte Ingles, fabulous boutiques and chic stores, the extraordinary Sunday Rastro street market is a fascinating experience to add to your itinerary.